You will receive an email with the Application Key for your license type. The email is sent from AccountManagement@noggle.online – please check your spam folder in case you don’t see it in your inbox. Once you get this email, your account has been activated in the Noggle network. You are all set. Please restart your Noggle application after you received the confirmation email with your application id. 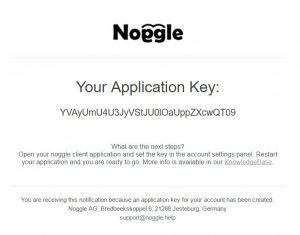 The Noggle client will login into the Noggle network during the next application start. That’s it! You are set and can start using our managed cognitive knowledge services. 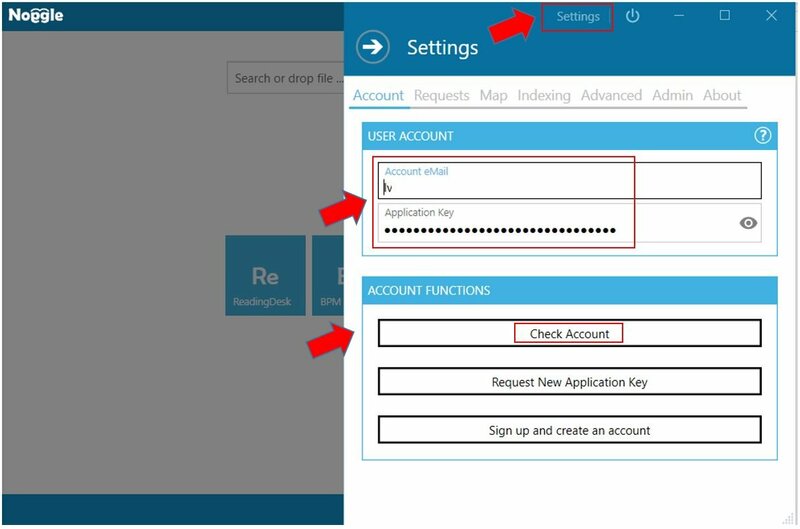 If your application settings have not been updated automatically, you can check and set your application id manually by using the Settings panel via the account tab. To activate your Client to use the managed cognitive services, go to the settings screen in the Noggle Client and select the “Account” tab. Put in your registered eMail in and set the Application Key you should have received via eMail. Click “Check Account” to link this client to the managed noggle services with your license. You start with a free trial license which allows full access to all Noggle service for 30 days. You can upgrade to a professional account to ensure cognitive services at any time.